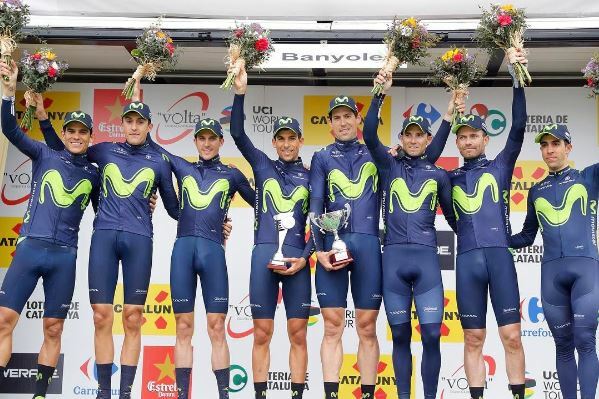 The race: Here's the story from winner Alejandro Valverde's Movistar team. 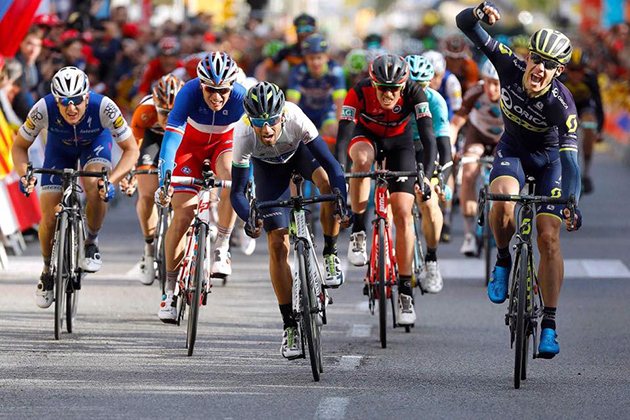 Alejandro Valverde crowned its overall victory in the 97th Volta Ciclista a Catalunya with a third stage victory in Barcelona. 'Bala' claimed honours at the 138km course, with eight laps of the famous Montjuïc mountain, to again respond to perfect Movistar team-work. Dan Martin's (QST) acceleration into the final kilometers encouraged the man from Murcia to anticipate a selected field's sprint and complete a week's exhibition victorious on the line –his 7th win of 2017, the 104th of his pro career. The Movistar Team rounded off an excellent week that saw the Blues claiming all four main classifications of the first Spanish WorldTour race of the season, putting up their 2017 victory tally to 13 in the process. With the only exceptions of Alberto Contador (TFS), 2nd overall, and Pierre Rolland (CDT), winner of the intermediate sprints' classification, the telephone squad's members were the only to step onto the final podium: Valverde won the GC and the KOM classification; Marc Soler finished 3rd as best Young Rider; and the Movistar riders were deservedly proclaimed the best squad in the race. Valverde's success is his second in the Volta a Catalunya after winning the 2009 race, and marks the eighth overall triumph for Eusebio Unzué's organization, with Indurain ('88, '91, '92), Chava Jiménez ('00), Karpets ('07) and Nairo Quintana (2016). Soler confirms his promising future, after signs of character with last year's Route du Sud queen stage victory and this month's third-place finish at the final stage of Paris-Nice. Alejandro Valverde: “The legs felt really good after such a difficult race as in Saturday, when we had to go through some difficult climbs at a very high pace, under the rain and with much cold. It was all completely different today, with pleasant weather, a short stage and - just like throughour the whole week - a magnificent job from my team-mates to control that 22-rider early break, later chased down by the other teams. At that final lap, I knew Martin would be jumping away at that point next to the Stadium, because he had done so in the past. I just went after him - though it took a lot for me to close the gap, when he stopped I could see that our advantage was decent. Since it wasn't the best cooperation between us two, we ended up starting that downhill sprint at a very much slower speed than the pursuit group. I just, barely managed to win the stage. "To be honest, I wasn't expecting to get these results. I knew I was in good condition leading up to this race, and those final training rides with Rojas and my team-mates in Andorra the week prior did good on me, but you had to keep in mind that I had spent a whole month without racing, since the Vuelta a Andalucía, while some other rivals like Alberto had a better racing pace. My plan was to go day-by-day, without setting my sights on the bigger goals, but my legs got better and better through the race, even more so today. The Volta is a race that I really like, and every time I take the start here is with an aim to do things well. My five team-mates were superb, and I don't want to forget about Castroviejo and Amador, who had to abandon with illness yet still did great while they could. We proved we were the strongest team at the TTT, and I tried to continue chasing victories to repay the whole squad after their fantastic effort on Tuesday and ever since." 2 Jarlinson PANTANO Trek-Segafredo s.t. 3 Arthur VICHOT FDJ s.t. 4 Rafal MAJKA Bora-hansgrohe s.t. 5 Daniel MARTIN Quick-Step s.t. 6 ALDEMAR REYES Manzana Postobon s.t. 7 Romain BARDET Ag2r La Mondiale s.t. 8 Davide FORMOLO Cannondale Drapac s.t. 9 George BENNETT Lotto NL-Jumbo s.t. 10 Steven KRUIJSWIJK Lotto NL-Jumbo s.t. 11 Michael WOODS Cannondale Drapac s.t. 12 Carlos VERONA Orica-Scott s.t. 13 Tejay VAN GARDEREN BMC s.t. 14 Adam YATES Orica-Scott s.t. 15 Alberto CONTADOR Trek-Segafredo s.t. 16 Marc SOLER Movistar s.t. 18 Lennard KÄMNA Sunweb s.t. 19 CYRIL GAUTIER Ag2r La Mondiale s.t. 20 Pierre Roger LATOUR Ag2r La Mondiale s.t. 21 Alexis VUILLERMOZ Ag2r La Mondiale s.t. 22 Jose ROJAS Movistar s.t. 23 Jacques JANSE VAN RENSBURG Dimension Data s.t. 24 Louis MEINTJES UAE Abu Dhabi s.t. 25 Felix GROSSSCHARTNER CCC Sprandi Polkowice s.t. 26 Ben O'CONNOR Dimension Data s.t. 27 JHON DARWIN ATAPUMA UAE Abu Dhabi s.t. 28 Robert GESINK Lotto NL-Jumbo s.t. 29 Tsgabu GRMAY Bahrain-Merida s.t. 30 Laurens TEN DAM Sunweb s.t. 31 Daniel NAVARRO Cofidis s.t. 35 Fabien DOUBEY Wanty-Groupe Gobert s.t. 36 Bart DE CLERCQ Lotto Soudal s.t. 37 Thomas DEGAND Wanty-Groupe Gobert s.t. 38 Nick VAN DER LIJKE Roompot-Nederlandse Loterij s.t. 39 Axel DOMONT Ag2r La Mondiale s.t. 41 Sergei CHERNETSKI Astana s.t. 42 Haimar ZUBELDIA Trek-Segafredo s.t. 43 Laurens DE PLUS Quick-Step s.t. 44 Pawel POLJANSKI Bora-hansgrohe s.t. 45 Ricardo VILELA Manzana Postobon s.t. 46 Jan BÁRTA Bora-hansgrohe s.t. 47 Robert KIŠERLOVSKI Katusha Alpecin s.t. 48 Chris FROOME Sky s.t. 50 Daryl IMPEY Orica-Scott s.t. 54 Pavel KOCHETKOV Katusha Alpecin s.t. 58 Alessandro DE MARCHI BMC s.t. 59 Ángel VICIOSO Katusha Alpecin s.t. 60 José MENDES Bora-hansgrohe s.t. 63 Brent BOOKWALTER BMC s.t. 64 Sergio PARDILLA Caja Rural-Seguros RGA s.t. 65 Ruben FERNANDEZ Movistar s.t. 66 Sindre SKJOESTAD LUNKE Sunweb s.t. 67 Jetse BOL Manzana Postobon s.t. 68 David GAUDU FDJ s.t. 69 Alexey VERMEULEN Lotto NL-Jumbo s.t. 70 Davide VILLELLA Cannondale Drapac s.t. 71 Natnael BERHANE Dimension Data s.t. 72 Rafael VALLS FERRI Lotto Soudal s.t. 73 Hernando BOHORQUEZ Manzana Postobon s.t. 74 Imanol ERVITI Movistar s.t. 75 Mikel NIEVE Sky s.t. 76 Julien SIMON Cofidis s.t. 77 Kristijan ÐURASEK UAE Abu Dhabi s.t. 78 Janez BRAJKOVIC Bahrain-Merida s.t. 79 Lachlan MORTON Dimension Data s.t. 80 Vasil KIRYIENKA Sky s.t. 81 Petr VAKOC Quick-Step s.t. 83 Lukasz OWSIAN CCC Sprandi Polkowice s.t. 84 Jeroen MEIJERS Roompot-Nederlandse Loterij s.t. 85 Nelson OLIVEIRA Movistar s.t. 86 Valerio CONTI UAE Abu Dhabi s.t. 87 Dario CATALDO Astana s.t. 88 BENOIT VAUGRENARD FDJ s.t. 89 Pierre ROLLAND Cannondale Drapac s.t. 93 Eduard PRADES Caja Rural-Seguros RGA s.t. 94 Daniel TEKLEHAIMANOT Dimension Data s.t. 95 Jakob FUGLSANG Astana s.t. 96 Enric MAS NICOLAU Quick-Step s.t. 97 Maximilian SCHACHMANN Quick-Step s.t. 98 Jérémy MAISON FDJ s.t. 99 Damien HOWSON Orica-Scott s.t. 100 Philip DEIGNAN Sky s.t. 101 Ondrej CINK Bahrain-Merida s.t. 102 Victor CAMPENAERTS Lotto NL-Jumbo s.t. 104 Johannes FRÖHLINGER Sunweb s.t. 106 Sam BEWLEY Orica-Scott s.t. 17 Tsgabu GRMAY Bahrain-Merida s.t. South African time trial champion Daryl Impey sprinted to victory on today’s penultimate stage in the Volta Ciclista a Catalunya. After 30 kilometres of racing the peloton saw significant splits with some of the race favourites missing out. Impey selflessly rode to make sure the group stayed away to help Adam Yates move up in the overall classification to fourth, before trying to recover enough to contest the reduced bunch sprint. “It was an interesting day today with the splits,” Impey explained. “We had quite a few guys in the front and in the end it was such a reduced front group. I was just happy to have the legs for the sprint because I rode quite hard early on. We moved Yates up overall so to get the win on top of that is fantastic. Impey, Yates, Verona and Damien Howson successfully made it into the front group and worked hard to make sure the race did not come back together, displaying great teamwork and determination. “Today was obviously a great day for us to move up in the overall classification and also win the stage,” sport director Neil Stephens said. “It is a big step for the team and it sums up the team spirit. We had staff come and recon the stage, we knew it was a good stage and a potential stage for Daryl. How it happened: After a tough summit finish yesterday the action kicked off once again on stage six. The first categorised climb of the day came after 25kilometres and saw significant splits within the peloton. A group of 53 riders quickly gained time on the second chase group, with favourites such as Chris Froome (Team Sky) caught out and in the second group. Yates, Howson, Verona Impey successfully made it into the front group and their sizeable group’s advantage grew out to five minutes 40seconds with 70kilometres remaining. Over two third category climbs and a first category, the Alt de Musara, the leading group rapidly extended their advantage to over 14minutes and reduced down from 53riders to just 28. The small bunch barrelled down the mountain and towards the stage finish in Reus, where Impey managed to recover enough to sprint to victory for Orica-Scott. 2 Alejandro VALVERDE Movistar s.t. 4 Petr VAKOC Quick-Step s.t. 5 Alessandro DE MARCHI BMC s.t. 6 Nick VAN DER LIJKE Roompot-Nederlandse Loterij s.t. 7 Dario CATALDO Astana s.t. 8 Lennard KÄMNA Sunweb s.t. 9 CYRIL GAUTIER Ag2r La Mondiale s.t. 10 Daniel MARTIN Quick-Step s.t. 11 Dion SMITH Wanty-Groupe Gobert s.t. 12 Rafal MAJKA Bora-hansgrohe s.t. 13 Romain BARDET Ag2r La Mondiale s.t. 14 Tsgabu GRMAY Bahrain-Merida s.t. 15 Davide VILLELLA Cannondale Drapac s.t. 16 Oscar RIESEBEEK Roompot-Nederlandse Loterij s.t. 17 Jordi SIMON CASULLERAS Soul Brasil s.t. 18 Steven KRUIJSWIJK Lotto NL-Jumbo s.t. 19 Louis VERVAEKE Lotto Soudal s.t. 20 Adam YATES Orica-Scott s.t. 21 Jose ROJAS Movistar s.t. 22 George BENNETT Lotto NL-Jumbo s.t. 23 Pierre ROLLAND Cannondale Drapac s.t. 24 Daniel NAVARRO Cofidis s.t. 25 Fabien DOUBEY Wanty-Groupe Gobert s.t. 26 Marc SOLER Movistar s.t. 27 Alberto CONTADOR Trek-Segafredo s.t. 28 Ricardo VILELA Manzana Postobon s.t. 29 JHON DARWIN ATAPUMA UAE Abu Dhabi s.t. 30 Jakob FUGLSANG Astana s.t. 31 Tejay VAN GARDEREN BMC s.t. 32 Carlos VERONA Orica-Scott s.t. 33 Laurens DE PLUS Quick-Step s.t. 38 Michael GOGL Trek-Segafredo s.t. 39 ALDEMAR REYES Manzana Postobon s.t. 40 Jesper HANSEN Astana s.t. 41 Natnael BERHANE Dimension Data s.t. 42 Imanol ERVITI Movistar s.t. 43 Felix GROSSSCHARTNER CCC Sprandi Polkowice s.t. 44 Laurens TEN DAM Sunweb s.t. 46 Johannes FRÖHLINGER Sunweb s.t. 47 BENOIT VAUGRENARD FDJ s.t. 52 Valerio CONTI UAE Abu Dhabi s.t. 54 Enric MAS NICOLAU Quick-Step s.t. 56 Pieter SERRY Quick-Step s.t. 57 Victor CAMPENAERTS Lotto NL-Jumbo s.t. 59 Guillaume BONNAFOND Cofidis s.t. 60 Jarlinson PANTANO Trek-Segafredo s.t. 61 Daniel TEKLEHAIMANOT Dimension Data s.t. 62 Axel DOMONT Ag2r La Mondiale s.t. 63 Ben O'CONNOR Dimension Data s.t. 64 Pawel POLJANSKI Bora-hansgrohe s.t. 65 Ondrej CINK Bahrain-Merida s.t. 66 Thomas DEGAND Wanty-Groupe Gobert s.t. 67 Rafael VALLS FERRI Lotto Soudal s.t. 68 Pavel KOCHETKOV Katusha Alpecin s.t. 69 David GAUDU FDJ s.t. 70 Alexis VUILLERMOZ Ag2r La Mondiale s.t. 71 Pierre Roger LATOUR Ag2r La Mondiale s.t. 72 Lukasz OWSIAN CCC Sprandi Polkowice s.t. 73 Léo VINCENT FDJ s.t. 74 Chris FROOME Sky s.t. 75 Alex HOWES Cannondale Drapac s.t. 76 Ben GASTAUER Ag2r La Mondiale s.t. 77 Chris HAMILTON Sunweb s.t. 78 Eduard PRADES Caja Rural-Seguros RGA s.t. 79 Robert KIŠERLOVSKI Katusha Alpecin s.t. 80 Xandro MEURISSE Wanty-Groupe Gobert s.t. 81 Bart DE CLERCQ Lotto Soudal s.t. 82 Alexey VERMEULEN Lotto NL-Jumbo s.t. 83 Jeroen MEIJERS Roompot-Nederlandse Loterij s.t. 84 Maciej PATERSKI CCC Sprandi Polkowice s.t. 85 André GREIPEL Lotto Soudal s.t. 86 Geraint THOMAS Sky s.t. 87 Brent BOOKWALTER BMC s.t. 88 Jay MCCARTHY Bora-hansgrohe s.t. 89 Haimar ZUBELDIA Trek-Segafredo s.t. 90 Sindre SKJOESTAD LUNKE Sunweb s.t. 91 Ángel VICIOSO Katusha Alpecin s.t. 92 Samuel SANCHEZ BMC s.t. 93 Matteo BONO UAE Abu Dhabi s.t. 94 Janez BRAJKOVIC Bahrain-Merida s.t. 95 Kristijan ÐURASEK UAE Abu Dhabi s.t. 96 Michael WOODS Cannondale Drapac s.t. 97 Julien SIMON Cofidis s.t. 98 Przemyslaw NIEMIEC UAE Abu Dhabi s.t. 99 Louis MEINTJES UAE Abu Dhabi s.t. 100 Jérémy MAISON FDJ s.t. 101 Sergio PARDILLA Caja Rural-Seguros RGA s.t. 102 José MENDES Bora-hansgrohe s.t. 103 Jetse BOL Manzana Postobon s.t. 104 Martijn TUSVELD Roompot-Nederlandse Loterij s.t. 105 Jacques JANSE VAN RENSBURG Dimension Data s.t. 106 Svein TUFT Orica-Scott s.t. 107 Sam BEWLEY Orica-Scott s.t. 108 Hernando BOHORQUEZ Manzana Postobon s.t. 109 Jan BÁRTA Bora-hansgrohe s.t. 110 Philip DEIGNAN Sky s.t. 111 Guillaume MARTIN Wanty-Groupe Gobert s.t. 112 Rein TAARAMÄE Katusha Alpecin s.t. 113 Vasil KIRYIENKA Sky s.t. 114 Mikel NIEVE Sky s.t. 19 Tsgabu GRMAY Bahrain-Merida s.t. 54 Guillaume MARTIN Wanty-Groupe Gobert s.t. 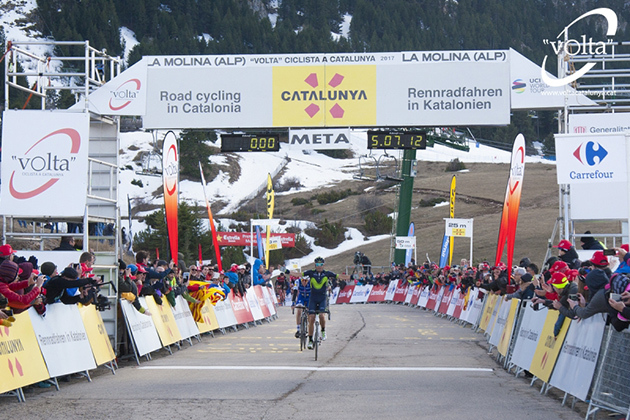 Alejandro Valverde was again unstoppable on the Cat-1 climb of Lo Port, end of stage five in the Volta a Catalunya. The Movistar Team's GC hope got back to the race leader on Friday, three days after being neglected the jersey following a controversional, collective one-minute penalty after Banyoles' team time trial. His win atop La Molina on Wednesday was the prelude of a sensational second victory in three days –his 5th of the season, the 102nd of his pro career– and the crown of a superb Movistar team-work –despite losing a man, as Jonathan Castroviejo fell sick and was DNS in the morning– all over the stage. Windy roads before the last climb propelled the lads directed by José Luis Arrieta and José Luis Laguía to break the peloton into four echelons through the lands of the Ebro delta, before Rubén Fernández and, most notably, a stellar Marc Soler took over into the climb. It was the 23-year-old Catalan climber who again showed his impressive talent to lead a five-man elite group –alongside Valverde, Contador, Froome and Adam Yates– that covered the last four kilometers together. Just before the 'flamme rouge', 'Bala' made his decisive move to leave all rivals behind and don the 'blanc-i-verd' jersey over the podium. The Movistar Team will now have to defend respective 21" and 47" gaps with Valverde against Froome and Contador –Soler sits 4th in the GC–. 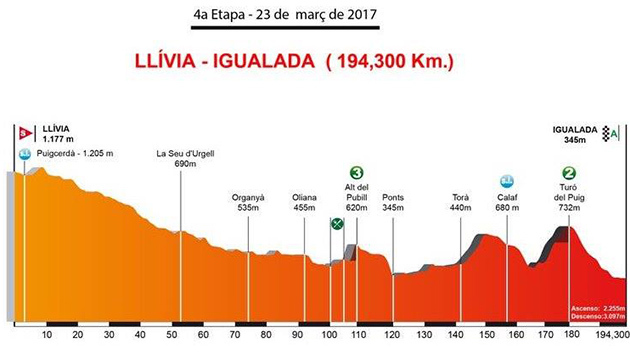 Two stages are remaining, starting with Saturday's lumpy roads between Tortosa and Reus, which include the Cat-1 La Mussara ascent, 40km from the end. Alejandro Valverde: "It was a spectacular day for both myself and the team, I'm so glad I could finish this off. It was an amazing day, all thanks to my team-mates. We kept full focus in the dangerous part of the stage, exposed to the wind, and all over the stage I had different team-mates surrounding me. At the final climb, Rubén Fernández and Marc Soler did a sensational job for me. From the very foot of the climb I was feeling like I had good legs, and I asked them to go on full steam for as long as they could. At the final two kilometers, I sought for my distance and launched the move with a pace I could hold until the line. "It's a victory and a leader's jersey really special, because of everything that happened during the last few days. Things like those, outside the racing itself, are not ones that we like. In the end, we managed to get people excited and happy about our racing, and that's what counts. Soler? It's a really talented boy, you all could see it. He won the Tour de l'Avenir, excelled into the mountains prior, but seeing how strong he rode this week, I can tell this to you: he's got whatever he wants to win in his legs." 3 Alberto CONTADOR Trek-Segafredo s.t. 11 Romain BARDET Ag2r La Mondiale s.t. 13 Rafal MAJKA Bora-hansgrohe s.t. 17 Jan HIRT CCC Sprandi Polkowice s.t. 18 George BENNETT Lotto NL-Jumbo s.t. 19 Davide FORMOLO Cannondale Drapac s.t. 22 Tejay VAN GARDEREN BMC s.t. 23 Jarlinson PANTANO Trek-Segafredo s.t. 24 Bauke MOLLEMA Trek-Segafredo s.t. 25 Louis MEINTJES UAE Abu Dhabi s.t. 27 Xandro MEURISSE Wanty-Groupe Gobert s.t. 34 Jacques JANSE VAN RENSBURG Dimension Data s.t. 39 Thomas DEGAND Wanty-Groupe Gobert s.t. 41 Tsgabu GRMAY Bahrain-Merida s.t. 43 Marco MINNAARD Wanty-Groupe Gobert s.t. 53 Jay MCCARTHY Bora-hansgrohe s.t. 54 Pawel POLJANSKI Bora-hansgrohe s.t. 55 Andrew TALANSKY Cannondale Drapac s.t. 56 Mikel LANDA MEANA Sky s.t. 60 Haimar ZUBELDIA Trek-Segafredo s.t. 61 Pavel KOCHETKOV Katusha Alpecin s.t. 62 Artyom ZAKHAROV Astana s.t. 63 Ben GASTAUER Ag2r La Mondiale s.t. 64 CYRIL GAUTIER Ag2r La Mondiale s.t. 67 Janez BRAJKOVIC Bahrain-Merida s.t. 69 Leszek PLUCINSKI CCC Sprandi Polkowice s.t. 70 Mikel NIEVE Sky s.t. 73 Rémi Cavagna Quick-Step s.t. 74 Silvio HERKLOTZ Bora-hansgrohe s.t. 75 Alexey VERMEULEN Lotto NL-Jumbo s.t. 76 Laurens DE PLUS Quick-Step s.t. 79 Sam BEWLEY Orica-Scott s.t. 80 Thomas DE GENDT Lotto Soudal s.t. 81 Damien HOWSON Orica-Scott s.t. 82 Pierre ROLLAND Cannondale Drapac s.t. 83 Maciej PATERSKI CCC Sprandi Polkowice s.t. 84 Murilo AFFONSO Soul Brasil s.t. 85 Jetse BOL Manzana Postobon s.t. 86 Stef CLEMENT Lotto NL-Jumbo s.t. 87 Robert GESINK Lotto NL-Jumbo s.t. 88 Jan BÁRTA Bora-hansgrohe s.t. 89 Johannes FRÖHLINGER Sunweb s.t. 90 Domen NOVAK Bahrain-Merida s.t. 93 Etienne VAN EMPEL Roompot-Nederlandse Loterij s.t. 94 Jose ROJAS Movistar s.t. 95 Paolo TIRALONGO Astana s.t. 96 Ángel VICIOSO Katusha Alpecin s.t. 97 Valerio CONTI UAE Abu Dhabi s.t. 98 Jordi SIMON Soul Brasil s.t. 99 Daniel TEKLEHAIMANOT Dimension Data s.t. 100 Dario CATALDO Astana s.t. 101 Imanol ERVITI Movistar s.t. 102 Ruben PLAZA Orica-Scott s.t. 103 Rein TAARAMÄE Katusha Alpecin s.t. 104 Daryl IMPEY Orica-Scott s.t. 105 Jérémy MAISON FDJ s.t. 106 Lennard KÄMNA Sunweb s.t. 107 Frederik VEUCHELEN Wanty-Groupe Gobert s.t. 108 Yukiya ARASHIRO Bahrain-Merida s.t. 109 Petr VAKOC Quick-Step s.t. 110 Lachlan MORTON Dimension Data s.t. 111 Arthur VICHOT FDJ s.t. 112 BENOIT VAUGRENARD FDJ s.t. 113 Magno Prado NAZARET Soul Brasil s.t. 114 Philip DEIGNAN Sky s.t. 115 François BIDARD Ag2r La Mondiale s.t. 116 Anass AIT EL ABDIA UAE Abu Dhabi s.t. 117 Pello BILBAO LOPEZ Astana s.t. 119 Guillaume BONNAFOND Cofidis s.t. 121 Brendan CANTY Cannondale Drapac s.t. 123 Tim ARIESEN Roompot-Nederlandse Loterij s.t. 124 Alex HOWES Cannondale Drapac s.t. 125 Svein TUFT Orica-Scott s.t. 126 Martijn KEIZER Lotto NL-Jumbo s.t. 127 Bert-Jan LINDEMAN Lotto NL-Jumbo s.t. 128 Victor CAMPENAERTS Lotto NL-Jumbo s.t. 129 Johan LE BON FDJ s.t. 130 Maxim BELKOV Katusha Alpecin s.t. 132 Nelson OLIVEIRA Movistar s.t. 133 Matteo BONO UAE Abu Dhabi s.t. 135 Joseph ROSSKOPF BMC s.t. 137 Michael GOGL Trek-Segafredo s.t. 140 André GREIPEL Lotto Soudal s.t. 141 Phil BAUHAUS Sunweb s.t. 142 Maximilian SCHACHMANN Quick-Step s.t. 143 Max WALSCHEID Sunweb s.t. 144 Kilian FRANKINY BMC s.t. 145 Jonas VAN GENECHTEN Cofidis s.t. 146 Piotr BROZYNA CCC Sprandi Polkowice s.t. 147 Natnael BERHANE Dimension Data s.t. 148 Caio GODOY ORMENESE Soul Brasil s.t. 149 Matthias BRÄNDLE Trek-Segafredo s.t. 150 Mekseb DEBESAY Dimension Data s.t. 151 Przemyslaw NIEMIEC UAE Abu Dhabi s.t. 152 Sergio PARDILLA BELLON Caja Rural-Seguros RGA s.t. 153 Geoffrey SOUPE Cofidis s.t. 154 Nicholas SCHULTZ Caja Rural-Seguros RGA s.t. 155 Ricardo VILELA Manzana Postobon s.t. 156 Hernando BOHORQUEZ Manzana Postobon s.t. 157 Hernan Ricardo AGUIRRE Manzana Postobon s.t. 158 Julien SIMON Cofidis s.t. 159 Jelle VANENDERT Lotto Soudal s.t. 160 Mateusz TACIAK CCC Sprandi Polkowice s.t. 161 Davide VILLELLA Cannondale Drapac s.t. 164 Daniil FOMINYKH Astana s.t. 165 Patryk STOSZ CCC Sprandi Polkowice s.t. 166 Diego RUBIO HERNANDEZ Caja Rural-Seguros RGA s.t. 168 Alessandro DE MARCHI BMC s.t. 12 Jarlinson PANTANO Trek-Segafredo s.t. 72 Pavel KOCHETKOV Katusha Alpecin s.t. 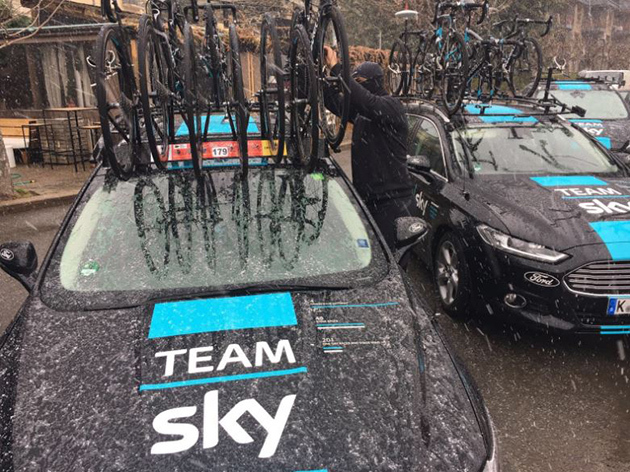 Team Sky cars getting ready to head to new start. 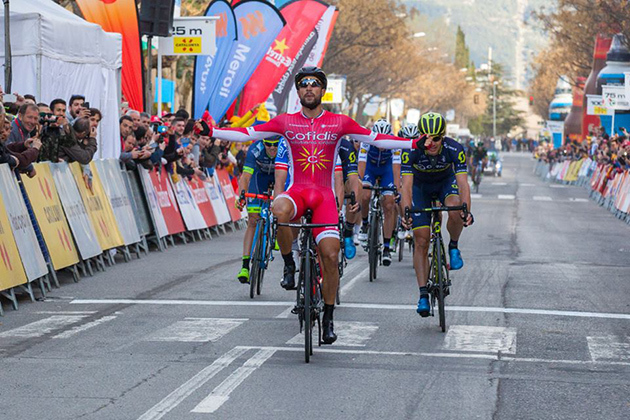 Snow and freezing temperatures saw Volta Ciclista a Catalunya stage 4 shortened with the race starting at KM 60, of the previously planned 184.3km stage, and Tejay van Garderen finishing safely in the bunch behind stage winner Nacer Bouhanni (Team Cofidis) to retain his leader's jersey. Having relocated from the planned start town of Llívia to Montferrer, the race eventually got underway with the peloton setting a fast pace and chasing down all early breakaway attempts as they headed down the valley. Eventually, after almost 40km of racing, a group of five riders was able to escape off the front of the peloton and quickly extend an advantage of 3'10". However, the peloton, being led by BMC Racing Team, kept the breakaway under control, cutting the gap to around 2'40" as they went over the top of the Alt del Pubill. With the second categorized climb of the day coming at just 20km to go, the chase began to heat up as teams battled for position in the peloton heading onto the slopes of Turo del Puig before reeling in the final breakaway rider with 18km remaining. Fireworks soon followed with attack after attack going over the summit of the category two climb and four riders forcing a reaction from the peloton behind as they opened up an advantage on the final descent into Igualada. With a bunch sprint up for grabs, the sprinters' teams, alongside BMC Racing Team, pushed hard to bring the race back together with Bouhanni the fastest on the day. Van Garderen finished safely in the bunch behind Bouhanni to maintain his overall lead on the General Classification, 41 seconds ahead of his BMC Racing Team teammate, Samuel Sánchez. Tejay van Garderen: "I think today went really well for us. We were about to start in a snow storm, but they made a good call to move us down the valley. It shortened the stage obviously, but it also kept everyone safe and dry. It was a relatively easier day today before a hectic final climb and descent to the finish, but I think we managed it well." "I feel really good going into tomorrow's stage. I'm confident in the team and myself. It will be a hard climb, and certainly, anything can happen. Wearing the leader's jersey always adds motivation. It gives you an extra gear or 20 extra watts so, hopefully, I can get to the base of the climb in a good position and then from there I just need to give it my best. That's all I can ask for." Sports Director, Jackson Stewart: "I think having the first 58km taken off today's stage potentially changed the outcome of the race slightly. Over the first hour, with 90km of downhill at the start of the stage, we would have seen a lot of cold and wet guys fighting hard to close any gaps and control the race. So, I don't think as many people would have passed the final climb but other than that I don't think it would have changed the overall General Classification." "When the final group of riders got away on the last descent we were a little nervous. It was a good group, and at that point, it was difficult to organize a chase. However, the speed behind them was so high with a lot of teams looking for a sprint and ultimately controlling the gap. It was a good try on their part, but for us, it was nice to see that the sprinters took the bonuses and that we stayed safe and finished on the same time." "Tomorrow is potentially the biggest stage of the race and will be an important day for the General Classification. Tejay van Garderen is looking solid, and Brent Bookwalter and Samuel Sánchez had good rides today as well. If we have a good climb tomorrow I think it will put us in a really strong position but it's not easy on Saturday and Sunday so, nothing is certain." 2 Davide CIMOLAI FDJ s.t. 3 Daryl IMPEY Orica-Scott s.t. 4 Alexander EDMONSON Orica-Scott s.t. 5 Dion SMITH Wanty-Groupe Gobert s.t. 6 Pieter SERRY Quick-Step s.t. 7 Enrico GASPAROTTO Bahrain-Merida s.t. 8 Petr VAKOC Quick-Step s.t. 9 Jose ROJAS Movistar s.t. 10 Bauke MOLLEMA Trek-Segafredo s.t. 11 Alejandro VALVERDE Movistar s.t. 12 Geraint THOMAS Sky s.t. 13 Daniel MARTIN Quick-Step s.t. 14 Romain BARDET Ag2r La Mondiale s.t. 15 Arthur VICHOT FDJ s.t. 16 Alberto CONTADOR Trek-Segafredo s.t. 17 Laurens DE PLUS Quick-Step s.t. 18 Rafal MAJKA Bora-hansgrohe s.t. 20 Sergei CHERNETSKI Astana s.t. 21 JHON DARWIN ATAPUMA UAE Abu Dhabi s.t. 22 Chris FROOME Sky s.t. 23 Adam YATES Orica-Scott s.t. 24 Pierre Roger LATOUR Ag2r La Mondiale s.t. 25 Ruben FERNANDEZ Movistar s.t. 26 Jarlinson PANTANO Trek-Segafredo s.t. 27 Julien SIMON Cofidis s.t. 28 Brent BOOKWALTER BMC s.t. 29 Stef CLEMENT Lotto NL-Jumbo s.t. 30 Samuel SANCHEZ BMC s.t. 31 Felix GROSSSCHARTNER CCC Sprandi Polkowice s.t. 32 José MENDES Bora-hansgrohe s.t. 33 Tejay VAN GARDEREN BMC s.t. 34 Tsgabu GRMAY Bahrain-Merida s.t. 35 David GAUDU FDJ s.t. 36 Jetse BOL Manzana Postobon s.t. 37 Xandro MEURISSE Wanty-Groupe Gobert s.t. 38 George BENNETT Lotto NL-Jumbo s.t. 39 Steven KRUIJSWIJK Lotto NL-Jumbo s.t. 41 Dario CATALDO Astana s.t. 42 Carlos VERONA Orica-Scott s.t. 43 Jonathan CASTROVIEJO Movistar s.t. 44 Marc SOLER GIMENEZ Movistar s.t. 45 Andrey AMADOR Movistar s.t. 46 Mikel NIEVE Sky s.t. 47 Thomas DEGAND Wanty-Groupe Gobert s.t. 48 Davide FORMOLO Cannondale Drapac s.t. 49 Laurens TEN DAM Sunweb s.t. 50 Louis MEINTJES UAE Abu Dhabi s.t. 51 Enric MAS NICOLAU Quick-Step s.t. 52 ALDEMAR REYES Manzana Postobon s.t. 53 Ricardo VILELA Manzana Postobon s.t. 54 Peter KENNAUGH Sky s.t. 55 Louis VERVAEKE Lotto Soudal s.t. 56 Mikel LANDA Sky s.t. 57 Ilnur ZAKARIN Katusha Alpecin s.t. 58 Jan HIRT CCC Sprandi Polkowice s.t. 62 Jay MCCARTHY Bora-hansgrohe s.t. 63 Pawel POLJANSKI Bora-hansgrohe s.t. 64 Peter STETINA Trek-Segafredo s.t. 65 Lennard KÄMNA Sunweb s.t. 66 Léo VINCENT FDJ s.t. 67 Daniel NAVARRO Cofidis s.t. 68 Sindre SKJOESTAD Sunweb s.t. 69 Martijn TUSVELD Roompot-Nederlandse Loterij s.t. 70 Nicholas SCHULTZ Caja Rural-Seguros RGA s.t. 71 Ondrej CINK Bahrain-Merida s.t. 72 Eduard PRADES Caja Rural-Seguros RGA s.t. 73 Fabien DOUBEY Wanty-Groupe Gobert s.t. 74 Guillaume MARTIN Wanty-Groupe Gobert s.t. 75 Alexis VUILLERMOZ Ag2r La Mondiale s.t. 76 Ruben PLAZA Orica-Scott s.t. 77 Hernando BOHORQUEZ Manzana Postobon s.t. 78 Valerio CONTI UAE Abu Dhabi s.t. 79 Davide VILLELLA Cannondale Drapac s.t. 80 Jakob FUGLSANG Astana s.t. 82 Tim ARIESEN Roompot-Nederlandse Loterij s.t. 83 Nick VAN DER LIJKE Roompot-Nederlandse Loterij s.t. 84 Haimar ZUBELDIA AGIRRE Trek-Segafredo s.t. 85 Natnael BERHANE Dimension Data s.t. 86 Kristian SBARAGLI Dimension Data s.t. 87 Ben O'CONNOR Dimension Data s.t. 88 Jacques JANSE VAN RENSBURG Dimension Data s.t. 89 Etienne VAN EMPEL Roompot-Nederlandse Loterij s.t. 90 Phil BAUHAUS Sunweb s.t. 91 Bart DE CLERCQ Lotto Soudal s.t. 92 André GREIPEL Lotto Soudal s.t. 93 Luis Guillermo MAS BONET Caja Rural-Seguros RGA s.t. 94 Przemyslaw NIEMIEC UAE Abu Dhabi s.t. 96 Oscar RIESEBEEK Roompot-Nederlandse Loterij s.t. 97 Guillaume LEVARLET Wanty-Groupe Gobert s.t. 98 Hector SAEZ BENITO Caja Rural-Seguros RGA s.t. 99 Silvio HERKLOTZ Bora-hansgrohe s.t. 100 Leszek PLUCINSKI CCC Sprandi Polkowice s.t. 101 Maximilian SCHACHMANN Quick-Step s.t. 102 Pello BILBAO Astana s.t. 103 Lukasz OWSIAN CCC Sprandi Polkowice s.t. 104 Brendan CANTY Cannondale Drapac s.t. 106 Kilian FRANKINY BMC s.t. 107 François BIDARD Ag2r La Mondiale s.t. 108 Magno Prado NAZARET Soul Brasil s.t. 109 Vasil KIRYIENKA Sky s.t. 110 Gianluca BRAMBILLA Quick-Step s.t. 111 Alexey VERMEULEN Lotto NL-Jumbo s.t. 112 Anass AIT EL ABDIA UAE Abu Dhabi s.t. 119 Jan BÁRTA Bora-hansgrohe s.t. 120 Joseph ROSSKOPF BMC s.t. 121 Matthias BRÄNDLE Trek-Segafredo s.t. 122 Paolo TIRALONGO Astana s.t. 123 Frederik VEUCHELEN Wanty-Groupe Gobert s.t. 124 Antonio NIBALI Bahrain-Merida s.t. 125 Max WALSCHEID Sunweb s.t. 126 Piotr BROZYNA CCC Sprandi Polkowice s.t. 127 Hugh CARTHY Cannondale Drapac s.t. 128 Marco MINNAARD Wanty-Groupe Gobert s.t. 129 Yukiya ARASHIRO Bahrain-Merida s.t. 130 Michael WOODS Cannondale Drapac s.t. 132 Axel DOMONT Ag2r La Mondiale s.t. 133 Chris HAMILTON Sunweb s.t. 134 Janez BRAJKOVIC Bahrain-Merida s.t. 136 Maciej PATERSKI CCC Sprandi Polkowice s.t. 137 Johannes FRÖHLINGER Sunweb s.t. 138 Robert KIŠERLOVSKI Katusha Alpecin s.t. 139 Murilo AFFONSO Soul Brasil s.t. 143 Alex HOWES Cannondale Drapac s.t. 146 Daniil FOMINYKH Astana s.t. 147 Artyom ZAKHAROV Astana s.t. 148 JUAN FELIPE OSORIO Manzana Postobon s.t. 151 Philip DEIGNAN Sky s.t. 152 Daniel TEKLEHAIMANOT Dimension Data s.t. 153 Jeroen MEIJERS Roompot-Nederlandse Loterij s.t. 154 Domen NOVAK Bahrain-Merida s.t. 156 Sam BEWLEY Orica-Scott s.t. 157 José GONÇALVES Katusha Alpecin s.t. 158 Maxim BELKOV Katusha Alpecin s.t. 159 Ángel VICIOSO Katusha Alpecin s.t. 160 Markel IRIZAR Trek-Segafredo s.t. 161 Imanol ERVITI Movistar s.t. 162 Diego RUBIO Caja Rural-Seguros RGA s.t. 163 Nelson OLIVEIRA Movistar s.t. 164 Diego ROSA Sky s.t. 165 Matteo BONO UAE Abu Dhabi s.t. 166 Pavel KOCHETKOV Katusha Alpecin s.t. 167 Bert-Jan LINDEMAN Lotto NL-Jumbo s.t. 168 Martijn KEIZER Lotto NL-Jumbo s.t. 169 Victor CAMPENAERTS Lotto NL-Jumbo s.t. 170 Pierre ROLLAND Cannondale Drapac s.t. 174 Svein TUFT Orica-Scott s.t. 175 Rein TAARAMÄE Katusha Alpecin s.t. 176 Martijn BUDDING Roompot-Nederlandse Loterij s.t. 177 Johan LE BON FDJ s.t. 178 Jelle VANENDERT Lotto Soudal s.t. 179 Ben HERMANS BMC s.t. 10 Jarlinson PANTANO Trek-Segafredo s.t. 19 Jonathan CASTROVIEJO Movistar s.t. 25 Jan HIRT CCC Sprandi Polkowice s.t. 32 Louis MEINTJES UAE Abu Dhabi s.t. 35 Jesper HANSEN Astana s.t. 44 Thomas DEGAND Wanty-Groupe Gobert s.t. 96 Davide CIMOLAI FDJ s.t. 134 Imanol ERVITI Movistar s.t. 135 Alessandro DE MARCHI BMC s.t. The race: Here's the report from new GC leader Tejay van Garderen's BMC team. 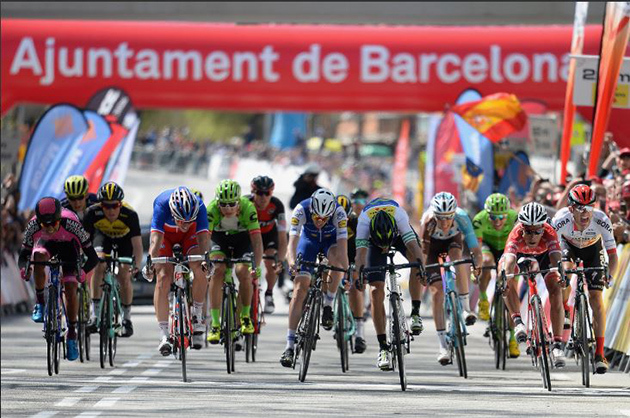 Volta Ciclista a Catalunya stage 3 ended with the race’s first summit finish, with Tejay van Garderen crossing the line in eighth place to move into the leader's jersey after an explosive finale on La Molina. The peloton kept several early moves under control, making it a fast start to the day with riders covering 42km in the first hour of racing. Eventually almost 60km into the 188.3km stage, five riders were able to loosen the grip of the peloton and began to extend an advantage which peaked at around seven minutes on the slopes of the Alt de Toses climb. With BMC Racing Team helping to set the pace behind, the gap to the breakaway began to fall with 60km and two climbs of La Molina remaining. As the breakaway went over the top of the first ascent of the well-known climb, the gap had been brought to within two minutes before dipping under a minute as the reduced peloton made the right hand turn to start round two. The pace continued to increase, and with the final breakaway rider reeled in, only a select group of General Classification contenders, including van Garderen, were left at the front of the race battling for position. 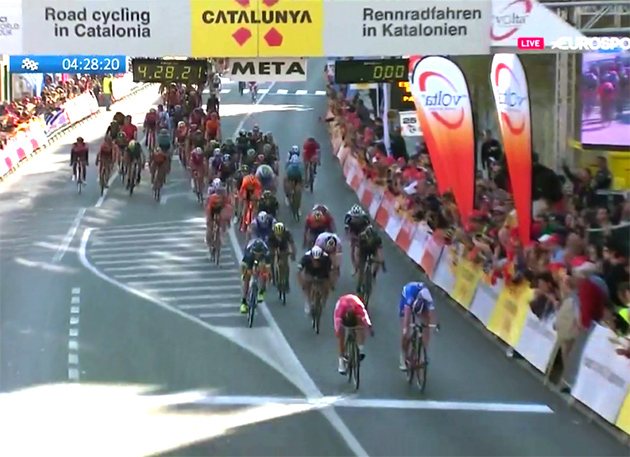 Despite multiple attacks inside the closing 5km, the group was still together with just 500m remaining before a burst of acceleration from Alejandro Valverde (Movistar Team) and Daniel Martin (Quick-Step Floor) saw the duo take first and second respectively. Van Garderen pushed on behind and put in a strong effort to take eighth on the stage and move into the leader's jersey, 41 seconds ahead of BMC Racing Team teammate, Samuel Sánchez. Rohan Dennis was forced to withdraw from racing due to illness, as detailed by BMC Racing Team doctor, Dr. Daniele Zaccaria below. Tejay van Garderen: "The team rode amazingly today with the breakaway taking over 60km to establish itself. We were confident heading into today's stage and, as we have good memories of La Molina, we were pretty sure we could keep the jersey. Yesterday there was a lot of commotion, and we put that behind us and got on with today's task." "It was all up in the air until just before today's stage when we eventually got the jersey and subsequently the responsibility to control the race. This meant we had to adjust our strategy, but I think we handled this well and showed we are the stronger team." "This is a big race. It has a lot of history and carries some weight being UCI WorldTour. We have a comfortable lead, but it's not a sure thing especially with stage 5 but the team has good morale, and we are motivated to do our best to defend this jersey." Sports Director, Jackson Stewart: "It was great to see Tejay van Garderen keep the jersey within the team and have a good stage today. We came here for Tejay, and he has already had a great TTT and a great first mountain stage. I think we had some pent up frustration after the stress of yesterday so, it was nice to see everyone giving everything once again and having a good stage." "We didn't know what to expect on the summit finish today. In previous years we knew it had been a fairly big group and with the headwind on the climb today we thought that might be the case again. In the end, it was a fairly select group, and you could see that there are 15-20 guys here for the GC." "The jersey, of course, adds some pressure but we have the team for it, and we knew this stage well. Tejay has won here before, and everyone was especially motivated to do well again." Rohan Dennis - Medical Update from BMC Racing Team Doctor, Dr. Daniele Zaccaria: "Rohan Dennis was managing a respiratory tract infection coming into this race, and we were monitoring his condition from when he arrived in Catalunya. We were able to manage the problem for the TTT which was a main objective for us. Now, with the colder weather in the mountains it was better for him to stop racing as we look at the bigger picture and the upcoming Giro d'Italia." 2 Daniel MARTIN Quick-Step s.t. 4 Romain BARDET Ag2r La Mondiale s.t. 5 Ilnur ZAKARIN Katusha Alpecin s.t. 6 Geraint THOMAS Sky s.t. 7 Alberto CONTADOR Trek-Segafredo s.t. 8 Tejay VAN GARDEREN BMC s.t. 10 Davide FORMOLO Cannondale Drapac s.t. 11 George BENNETT Lotto NL-Jumbo s.t. 12 Chris FROOME Sky s.t. 15 Carlos VERONA Orica-Scott s.t. 17 JHON DARWIN ATAPUMA UAE Abu Dhabi s.t. 18 Bauke MOLLEMA Trek-Segafredo s.t. 19 Jarlinson PANTANO Trek-Segafredo s.t. 20 Marc SOLER GIMENEZ Movistar s.t. 24 Louis VERVAEKE Lotto Soudal s.t. 26 Jan HIRT CCC Sprandi Polkowice s.t. 27 Samuel SANCHEZ BMC s.t. 30 Jonathan CASTROVIEJO Movistar s.t. 31 Ricardo VILELA Manzana Postobon s.t. 33 Daniel NAVARRO Cofidis s.t. 34 Laurens TEN DAM Sunweb s.t. 37 Dario CATALDO Astana s.t. 39 Xandro MEURISSE Wanty-Groupe Gobert s.t. 40 Axel DOMONT Ag2r La Mondiale s.t. 41 Alexis VUILLERMOZ Ag2r La Mondiale s.t. 42 Nicholas SCHULTZ Caja Rural-Seguros RGA s.t. 43 Rafael VALLS FERRI Lotto Soudal s.t. 44 Guillaume MARTIN Wanty-Groupe Gobert s.t. 45 Thomas DEGAND Wanty-Groupe Gobert s.t. 46 Jesper HANSEN Astana s.t. 47 Sergei CHERNETSKI Astana s.t. 54 Tsgabu GRMAY Bahrain-Merida s.t. 56 Peter STETINA Trek-Segafredo s.t. 57 Haimar ZUBELDIA Trek-Segafredo s.t. 58 Enric MAS NICOLAU Quick-Step s.t. 59 Ruben PLAZA Orica-Scott s.t. 63 Marco MINNAARD Wanty-Groupe Gobert s.t. 66 ALDEMAR REYES Manzana Postobon s.t. 67 Guillaume LEVARLET Wanty-Groupe Gobert s.t. 68 Anass AIT EL ABDIA UAE Abu Dhabi s.t. 69 Lukasz OWSIAN CCC Sprandi Polkowice s.t. 71 Vasil KIRYIENKA Sky s.t. 74 Jordi SIMON CASULLERAS Soul Brasil s.t. 75 Valerio CONTI UAE Abu Dhabi s.t. 76 Nick VAN DER LIJKE Roompot-Nederlandse Loterij s.t. 77 Jose ROJAS Movistar s.t. 78 Jérémy MAISON FDJ s.t. 79 Ángel VICIOSO ARCOS Katusha Alpecin s.t. 80 Przemyslaw NIEMIEC UAE Abu Dhabi s.t. 81 Chris HAMILTON Sunweb s.t. 82 Ben GASTAUER Ag2r La Mondiale s.t. 83 CYRIL GAUTIER Ag2r La Mondiale s.t. 84 Lennard KÄMNA Sunweb s.t. 85 Laurens DE PLUS Quick-Step s.t. 86 Magno Prado NAZARET Soul Brasil s.t. 87 Pieter WEENING Roompot-Nederlandse Loterij s.t. 88 Lachlan MORTON Dimension Data s.t. 93 Brent BOOKWALTER BMC s.t. 94 Andrew TALANSKY Cannondale Drapac s.t. 95 José MENDES Bora-hansgrohe s.t. 97 Daryl IMPEY Orica-Scott s.t. 98 Jay MCCARTHY Bora-hansgrohe s.t. 99 Nathan HAAS Dimension Data s.t. 100 Bert-Jan LINDEMAN Lotto NL-Jumbo s.t. 101 Jetse BOL Manzana Postobon s.t. 102 Jeroen MEIJERS Roompot-Nederlandse Loterij s.t. 103 Alexey VERMEULEN Lotto NL-Jumbo s.t. 105 Kilian FRANKINY BMC s.t. 106 Paolo TIRALONGO Astana s.t. 107 Artyom ZAKHAROV Astana s.t. 108 Martijn KEIZER Lotto NL-Jumbo s.t. 109 Leszek PLUCINSKI CCC Sprandi Polkowice s.t. 110 Arthur VICHOT FDJ s.t. 111 Davide VILLELLA Cannondale Drapac s.t. 112 Hector SAEZ BENITO Caja Rural-Seguros RGA s.t. 113 Fabien DOUBEY Wanty-Groupe Gobert s.t. 114 Dion SMITH Wanty-Groupe Gobert s.t. 115 Robert KIŠERLOVSKI Katusha Alpecin s.t. 116 Janez BRAJKOVIC Bahrain-Merida s.t. 117 Imanol ERVITI Movistar s.t. 118 Guillaume BONNAFOND Cofidis s.t. 119 Sergio PARDILLA Caja Rural-Seguros RGA s.t. 120 BENOIT VAUGRENARD FDJ s.t. 121 Nelson OLIVEIRA Movistar s.t. 122 Johan LE BON FDJ s.t. 123 Matteo BONO UAE Abu Dhabi s.t. 124 Oscar RIESEBEEK Roompot-Nederlandse Loterij s.t. 125 Mekseb DEBESAY Dimension Data s.t. 126 Diego ROSA Sky s.t. 127 Jelle VANENDERT Lotto Soudal s.t. 128 Antonio NIBALI Bahrain-Merida s.t. 129 François BIDARD Ag2r La Mondiale s.t. 130 Pello BILBAO Astana s.t. 131 Martijn BUDDING Roompot-Nederlandse Loterij s.t. 132 Maximilian SCHACHMANN Quick-Step s.t. 134 Michael GOGL Trek-Segafredo s.t. 137 JUAN FELIPE OSORIO Manzana Postobon s.t. 138 Maciej PATERSKI CCC Sprandi Polkowice s.t. 139 Joseph ROSSKOPF BMC s.t. 140 Markel IRIZAR Trek-Segafredo s.t. 141 Rémi Cavagna Quick-Step s.t. 142 Jan BÁRTA Bora-hansgrohe s.t. 143 Silvio HERKLOTZ Bora-hansgrohe s.t. 144 Matthias BRÄNDLE Trek-Segafredo s.t. 145 Frederik VEUCHELEN Wanty-Groupe Gobert s.t. 146 Tim ARIESEN Roompot-Nederlandse Loterij s.t. 147 Murilo AFFONSO Soul Brasil s.t. 148 Alex HOWES Cannondale Drapac s.t. 149 Kristijan ÐURASEK UAE Abu Dhabi s.t. 150 Kristian SBARAGLI Dimension Data s.t. 151 Domen NOVAK Bahrain-Merida s.t. 152 Brendan CANTY Cannondale Drapac s.t. 153 Yukiya ARASHIRO Bahrain-Merida s.t. 154 Gianluca BRAMBILLA Quick-Step s.t. 155 Stéphane ROSSETTO Cofidis s.t. 156 André GREIPEL Lotto Soudal s.t. 157 Eduard PRADES Caja Rural-Seguros RGA s.t. 158 Caio GODOY ORMENESE Soul Brasil s.t. 159 Luis Guillermo MAS BONET Caja Rural-Seguros RGA s.t. 160 Julien SIMON Cofidis s.t. 161 Pierre ROLLAND Cannondale Drapac s.t. 162 Piotr BROZYNA CCC Sprandi Polkowice s.t. 163 Dylan PAGE Caja Rural-Seguros RGA s.t. 164 Daniel TEKLEHAIMANOT Dimension Data s.t. 165 Jacques JANSE VAN RENSBURG Dimension Data s.t. 166 Etienne VAN EMPEL Roompot-Nederlandse Loterij s.t. 167 Rein TAARAMÄE Katusha Alpecin s.t. 168 Phil BAUHAUS Sunweb s.t. 169 Maxim BELKOV Katusha Alpecin s.t. 170 Max WALSCHEID Sunweb s.t. 171 Pascal ACKERMANN Bora-hansgrohe s.t. 172 Nacer BOUHANNI Cofidis s.t. 173 Svein TUFT Orica-Scott s.t. 174 Patryk STOSZ CCC Sprandi Polkowice s.t. 175 Mateusz TACIAK CCC Sprandi Polkowice s.t. 176 Daniil FOMINYKH Astana s.t. 177 Alexander EDMONSON Orica-Scott s.t. 178 Victor CAMPENAERTS Lotto NL-Jumbo s.t. 179 Jonas VAN GENECHTEN Cofidis s.t. 180 Geoffrey SOUPE Cofidis s.t. 181 Davide CIMOLAI FDJ s.t. 182 José GONÇALVES Katusha Alpecin s.t. 18 Robert GESINK Lotto NL-Jumbo s.t. 20 Jonathan CASTROVIEJO Movistar s.t. 27 Jan HIRT CCC Sprandi Polkowice s.t. 29 Michael WOODS Cannondale Drapac s.t. 35 Louis MEINTJES UAE Abu Dhabi s.t. 39 Jesper HANSEN Astana s.t. 48 Guillaume MARTIN Wanty-Groupe Gobert s.t. 96 Imanol ERVITI Movistar s.t. 103 Johan LE BON FDJ s.t. 121 Martijn BUDDING Roompot-Nederlandse Loterij s.t. 125 Fabien DOUBEY Wanty-Groupe Gobert s.t. 128 José GONÇALVES Katusha Alpecin s.t. 134 Domen NOVAK Bahrain-Merida s.t. 145 Geoffrey SOUPE Cofidis s.t. 146 Stéphane ROSSETTO Cofidis s.t. 148 Luis Guillermo MAS BONET Caja Rural-Seguros RGA s.t. 160 Daniel TEKLEHAIMANOT Dimension Data s.t. The race: Initially Movistar was awarded the stage win. But the next day (Wednesday, the 22nd) it was decided that the rules required the entire Movistar team be penalized 1 minute because José Rojas had pushed a couple of teammates up a hill. 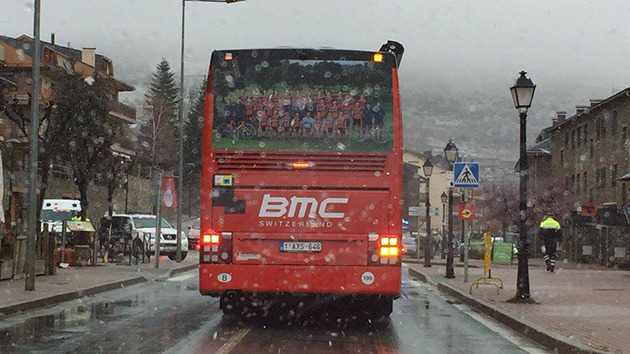 That dropped the squad to third place, making BMC the winner and Ben Hermans the GC leader. For historical purposes I have left the original results posted below the revised results. José Joaquin Rojas was initially thought to be the new GC leader, but he was penalized 3 minutes for pushing teammates up a hill. That penalty made Alejandro Valverde the GC leader. A magnificent ride rewarded the whole Movistar Team with their 10th success of the 2017 season on stage two of the Volta a Catalunya, a 41km TTT in Banyoles where the squad directed by José Luis Arrieta and José Luis Laguía narrowly edged out World champions BMC after the latter clocked a time impossible to beat for their rivals. The telephone squad was the only one able to compete against the American team, initially putting eight seconds on the red formation after 21km in. The Blues resisted into a demanding second half, as Valverde, Amador, Castroviejo, Soler, Fernández, Oliveira, Erviti and José Joaquín Rojas reached the line together to claim the leader's jersey. The Movistar Team's biggest hope for the overall success, Alejandro Valverde, put 46 seconds on Chris Froome (SKY) and 1'15" on Alberto Contador (TFS), the main contenders for an overall classification surely hard-fought all the way to Barcelona on Sunday. The Movistar Team will defend its coveted position on Wednesday at a demanding stage three, the first of two mountain-top finishes in the Volta towards La Molina (Cat-1). A first passage through the last climb will be tackled 25km from the finish, riders up for a demanding course with 4,300m vertical gain in 188km. Alejandro Valverde: “It was a very tough time trial. We knew it would be hard, because we had ridden it five times during the last few days. It was a technical one, and knowing the course well ended up being key. We feared a bit the rain, because it would have made for a dangerous course, but we were lucky in the end and we got through it safe. "We must go day-by-day, yet we put a very important gap on strong rivals today. It will be very difficult tomorrow, and I'm worried about bad weather again - let's hope we can stay dry all week. My legs have been feeling good over the last few days, despite not having raced anything since Andalucía, so I hope I can keep the jersey. Obviously, though, having Contador or Froome contesting it will make for a difficult defense." 2 Brent BOOKWALTER BMC s.t. 3 Tejay VAN GARDEREN BMC s.t. 4 Rohan DENIS BMC s.t. 5 Kilian FRANKINY BMC s.t. 6 Alessandro DE MARCHI BMC s.t. 7 Samuel SANCHEZ GONZALEZ BMC s.t. 9 Peter KENNAUGH Sky s.t. 10 Mikel NIEVE ITURRALDE Sky s.t. 11 Philip DEIGNAN Sky s.t. 12 Mikel LANDA MEANA Sky s.t. 13 Chris FROOME Sky s.t. 16 Ruben FERNANDEZ ANDUJAR Movistar s.t. 17 Imanol ERVITI Movistar s.t. 18 Marc SOLER GIMENEZ Movistar s.t. 22 Alberto CONTADOR VELASCO Trek-Segafredo s.t. 23 Bauke MOLLEMA Trek-Segafredo s.t. 24 Haimar ZUBELDIA AGIRRE Trek-Segafredo s.t. 25 Jarlinson PANTANO GOMEZ Trek-Segafredo s.t. 27 Adam YATES Orica-Scott s.t. 28 Damien HOWSON Orica-Scott s.t. 29 Sam BEWLEY Orica-Scott s.t. 30 Carlos VERONA Orica-Scott s.t. 34 David GAUDU FDJ s.t. 35 Arthur VICHOT FDJ s.t. 36 Léo VINCENT FDJ s.t. 37 Tobias LUDVIGSSON FDJ s.t. 40 George BENNETT Lotto NL-Jumbo s.t. 41 Stef CLEMENT Lotto NL-Jumbo s.t. 42 Steven KRUIJSWIJK Lotto NL-Jumbo s.t. 43 Alexey VERMEULEN Lotto NL-Jumbo s.t. 44 Johan LE BON FDJ s.t. 47 Jakob FUGLSANG Astana s.t. 48 Sergei CHERNETSKI Astana s.t. 49 Jesper HANSEN Astana s.t. 50 Pello BILBAO LOPEZ DE ARMENTIA Astana s.t. 52 Rafael VALLS FERRI Lotto Soudal s.t. 53 Louis VERVAEKE Lotto Soudal s.t. 55 Pieter SERRY Quick-Step s.t. 56 Maximilian SCHACHMANN Quick-Step s.t. 57 Daniel MARTIN Quick-Step s.t. 58 Laurens DE PLUS Quick-Step s.t. 59 Enric MAS NICOLAU Quick-Step s.t. 61 Romain BARDET Ag2r La Mondiale s.t. 62 Ben GASTAUER Ag2r La Mondiale s.t. 65 Rafal MAJKA Bora-hansgrohe s.t. 66 Jan BÁRTA Bora-hansgrohe s.t. 67 José MENDES Bora-hansgrohe s.t. 69 Maciej PATERSKI CCC Sprandi Polkowice s.t. 70 Leszek PLUCINSKI CCC Sprandi Polkowice s.t. 71 Jan HIRT CCC Sprandi Polkowice s.t. 73 Rein TAARAMÄE Katusha Alpecin s.t. 74 José GONÇALVES Katusha Alpecin s.t. 75 Pavel KOCHETKOV Katusha Alpecin s.t. 76 Robert KIŠERLOVSKI Katusha Alpecin s.t. 80 Anass AIT EL ABDIA UAE Abu Dhabi s.t. 81 Kristijan ÐURASEK UAE Abu Dhabi s.t. 82 Louis MEINTJES UAE Abu Dhabi s.t. 83 Przemyslaw NIEMIEC UAE Abu Dhabi s.t. 86 Laurens TEN DAM Sunweb s.t. 87 Chris HAMILTON Sunweb s.t. 92 Janez BRAJKOVIC Bahrain-Merida s.t. 93 Ondrej CINK Bahrain-Merida s.t. 94 Tsgabu Gebremaryam GRMAY Bahrain-Merida s.t. 95 Domen NOVAK Bahrain-Merida s.t. 98 Davide FORMOLO Cannondale Drapac s.t. 99 Michael WOODS Cannondale Drapac s.t. 100 Andrew TALANSKY Cannondale Drapac s.t. 101 Hugh CARTHY Cannondale Drapac s.t. 103 Jacques JANSE VAN RENSBURG Dimension Data s.t. 104 Mekseb DEBESAY Dimension Data s.t. 105 Ben O'CONNOR Dimension Data s.t. 106 Lachlan MORTON Dimension Data s.t. 109 Nick VAN DER LIJKE Roompot-Nederlandse Loterij s.t. 110 Oscar RIESEBEEK Roompot-Nederlandse Loterij s.t. 111 Etienne VAN EMPEL Roompot-Nederlandse Loterij s.t. 112 Martijn BUDDING Roompot-Nederlandse Loterij s.t. 115 Guillaume LEVARLET Wanty-Groupe Gobert s.t. 116 Xandro MEURISSE Wanty-Groupe Gobert s.t. 117 Fabien DOUBEY Wanty-Groupe Gobert s.t. 118 Thomas DEGAND Wanty-Groupe Gobert s.t. 119 Guillaume MARTIN Wanty-Groupe Gobert s.t. 120 Marco MINNAARD Wanty-Groupe Gobert s.t. 124 Ricardo VILELA Manzana Postobon s.t. 125 JUAN FELIPE OSORIO ARBOLEDA Manzana Postobon s.t. 126 ALDEMAR REYES ORTEGA Manzana Postobon s.t. 127 Hernan Ricardo AGUIRRE CAIPA Manzana Postobon s.t. 130 Julien SIMON Cofidis s.t. 131 Stéphane ROSSETTO Cofidis s.t. 132 Guillaume BONNAFOND Cofidis s.t. 133 Daniel NAVARRO GARCIA Cofidis s.t. 136 Nicholas SCHULTZ Caja Rural-Seguros RGA s.t. 137 Sergio PARDILLA BELLON Caja Rural-Seguros RGA s.t. 138 Diego RUBIO HERNANDEZ Caja Rural-Seguros RGA s.t. 139 Antonio MOLINA CANET Caja Rural-Seguros RGA s.t. 140 Luis Guillermo MAS BONET Caja Rural-Seguros RGA s.t. 142 CYRIL GAUTIER Ag2r La Mondiale s.t. 146 Caio GODOY ORMENESE Soul Brasil s.t. 158 Manuele MORI UAE Abu Dhabi s.t. 162 Daniel TEKLEHAIMANOT Dimension Data s.t. GC after Stage 2: Here is the UCI's GC ranking. 2 Ruben FERNANDEZ Movistar s.t. 3 Imanol ERVITI Movistar s.t. 4 Marc SOLER Movistar s.t. 5 Jonathan CASTROVIEJO Movistar s.t. 7 Brent BOOKWALTER BMC s.t. 9 Rohan DENIS BMC s.t. 11 Alessandro DE MARCHI BMC s.t. 12 Samuel SANCHEZ BMC s.t. 14 Peter KENNAUGH Sky s.t. 15 Mikel NIEVE ITURRALDE Sky s.t. 16 Philip DEIGNAN Sky s.t. 17 Mikel LANDA MEANA Sky s.t. 18 Chris FROOME Sky s.t. 22 Adam YATES Orica-Scott s.t. 23 Damien HOWSON Orica-Scott s.t. 24 Sam BEWLEY Orica-Scott s.t. 25 Carlos VERONA Orica-Scott s.t. 29 David GAUDU FDJ s.t. 30 Arthur VICHOT FDJ s.t. 31 Léo VINCENT FDJ s.t. 32 Tobias LUDVIGSSON FDJ s.t. 35 George BENNETT Lotto NL-Jumbo s.t. 36 Stef CLEMENT Lotto NL-Jumbo s.t. 37 Steven KRUIJSWIJK Lotto NL-Jumbo s.t. 38 Alexey VERMEULEN Lotto NL-Jumbo s.t. 39 Johan LE BON FDJ s.t. 42 Jakob FUGLSANG Astana s.t. 43 Sergei CHERNETSKI Astana s.t. 44 Jesper HANSEN Astana s.t. 45 Pello BILBAO Astana s.t. 47 Rafael VALLS FERRI Lotto Soudal s.t. 48 Louis VERVAEKE Lotto Soudal s.t. 50 Pieter SERRY Quick-Step s.t. 51 Maximilian SCHACHMANN Quick-Step s.t. 52 Daniel MARTIN Quick-Step s.t. 53 Laurens DE PLUS Quick-Step s.t. 56 Romain BARDET Ag2r La Mondiale s.t. 57 Michael GOGL Trek-Segafredo s.t. 58 Bauke MOLLEMA Trek-Segafredo s.t. 59 Haimar ZUBELDIA Trek-Segafredo s.t. 61 Ben GASTAUER Ag2r La Mondiale s.t. 64 Rafal MAJKA Bora-hansgrohe s.t. 65 Jan BÁRTA Bora-hansgrohe s.t. 66 José MENDES Bora-hansgrohe s.t. 68 Maciej PATERSKI CCC Sprandi Polkowice s.t. 70 Jan HIRT CCC Sprandi Polkowice s.t. 72 Rein TAARAMÄE Katusha Alpecin s.t. 73 José GONÇALVES Katusha Alpecin s.t. 74 Pavel KOCHETKOV Katusha Alpecin s.t. 75 Robert KIŠERLOVSKI Katusha Alpecin s.t. 79 Anass AIT EL ABDIA UAE Abu Dhabi s.t. 80 Kristijan ÐURASEK UAE Abu Dhabi s.t. 81 Louis MEINTJES UAE Abu Dhabi s.t. 82 Przemyslaw NIEMIEC UAE Abu Dhabi s.t. 85 Alberto CONTADOR Trek-Segafredo s.t. 91 Yukiya ARASHIRO Bahrain-Merida s.t. 94 Tsgabu GRMAY Bahrain-Merida s.t. 125 JUAN FELIPE OSORIO Manzana Postobon s.t. 126 ALDEMAR REYES Manzana Postobon s.t. 127 Hernan Ricardo AGUIRRE Manzana Postobon s.t. 137 Sergio PARDILLA Caja Rural-Seguros RGA s.t. 138 Diego RUBIO Caja Rural-Seguros RGA s.t. 178 Alexandre GENIEZ Ag2r La Mondiale s.t. 183 Max WALSCHEID Sunweb s.t. 2 BOUHANNI, Nacer COFIDIS s.t. 3 SBARAGLI, Kristian DIMENSION DATA s.t. 4 SMITH, Dion WANTY-GROUPE GOBERT s.t. 5 GREIPEL, Andre LOTTO SOUDAL s.t. 6 ROJAS, Jose MOVISTAR s.t. 7 IMPEY, Daryl ORICA-SCOTT s.t. 8 VAKOC, Petr QUICK-STEP FLOORS s.t. 9 BAUHAUS, Phil TEAM SUNWEB s.t. 10 GASPAROTTO, Enrico BAHRAIN-MERIDA s.t. 11 VAN DER LIJKE, Nick ROOMPOT-NEDERLANDSE LOTERIJ s.t. 12 TUSVELD, Martijn ROOMPOT-NEDERLANDSE LOTERIJ s.t. 13 SERRY, Pieter QUICK-STEP FLOORS s.t. 14 VALVERDE, Alejandro MOVISTAR s.t. 15 GROßSCHARTNER, Felix CCC SPRANDI POLKOWICE s.t. 16 LEVARLET, Guillaume WANTY-GROUPE GOBERT s.t. 17 SIMON, Jordi SOUL BRASIL s.t. 18 CATALDO, Dario ASTANA s.t. 19 THOMAS, Geraint SKY s.t. 20 CONTI, Valerio UAE ABU DHABI s.t. 21 LATOUR, Pierre Roger AG2R LA MONDIALE s.t. 22 SCHACHMANN, Maximilian QUICK-STEP FLOORS s.t. 23 BENEDETTI, Cesare BORA-HANSGROHE s.t. 24 ZAKARIN, Ilnur KATUSHA-ALPECIN s.t. 25 AMADOR, Andrey MOVISTAR s.t. 26 MCCARTHY, Jay BORA-HANSGROHE s.t. 27 MARTIN, Daniel QUICK-STEP FLOORS s.t. 28 ARASHIRO, Yukiya BAHRAIN-MERIDA s.t. 29 HOWSON, Damien ORICA-SCOTT s.t. 30 GESINK, Robert LOTTO NL-JUMBO s.t. 31 YATES, Adam ORICA-SCOTT s.t. 32 POLJANSKI, Pawel BORA-HANSGROHE s.t. 33 RIESEBEEK, Oscar ROOMPOT-NEDERLANDSE LOTERIJ s.t. 34 GODOY ORMENESE, Caio SOUL BRASIL s.t. 35 BERHANE, Natnael DIMENSION DATA s.t. 36 FUGLSANG, Jakob ASTANA s.t. 37 FERNANDEZ, Ruben MOVISTAR s.t. 38 MEURISSE, Xandro WANTY-GROUPE GOBERT s.t. 39 LUNKE, Sindre Skjøstad TEAM SUNWEB s.t. 40 BOL, Jetse MANZANA POSTOBON s.t. 41 BRAJKOVIC, Janez BAHRAIN-MERIDA s.t. 42 PATERSKI, Maciej CCC SPRANDI POLKOWICE s.t. 43 MOLANO, Juan S. MANZANA POSTOBON s.t. 44 ROSA, Diego SKY s.t. 45 BARDET, Romain AG2R LA MONDIALE s.t. 46 BOOKWALTER, Brent BMC s.t. 47 HERMANS, Ben BMC s.t. 48 SOUPE, Geoffrey COFIDIS s.t. 49 SIMON, Julien COFIDIS s.t. 50 GOGL, Michael TREK-SEGAFREDO s.t. 51 BARTA, Jan BORA-HANSGROHE s.t. 52 MAJKA, Rafal BORA-HANSGROHE s.t. 53 ATAPUMA, Jhon Darwin UAE ABU DHABI s.t. 54 VILELA, Ricardo MANZANA POSTOBON s.t. 55 BENNETT, George LOTTO NL-JUMBO s.t. 56 LINDEMAN, Bert-Jan LOTTO NL-JUMBO s.t. 57 CONTADOR, Alberto TREK-SEGAFREDO s.t. 58 KENNAUGH, Peter SKY s.t. 59 CLEMENT, Stef LOTTO NL-JUMBO s.t. 60 VALLS, Rafael LOTTO SOUDAL s.t. 61 VAN GARDEREN, Tejay BMC s.t. 62 MAISON, Jerémy FDJ s.t. 63 VAN EMPEL, Etienne ROOMPOT-NEDERLANDSE LOTERIJ s.t. 64 BOHORQUEZ, Hernando MANZANA POSTOBON s.t. 65 MOLLEMA, Bauke TREK-SEGAFREDO s.t. 66 DE PLUS, Laurens QUICK-STEP FLOORS s.t. 67 KRUIJSWIJK, Steven LOTTO NL-JUMBO s.t. 68 OLIVEIRA, Nelson MOVISTAR s.t. 69 OSORIO, Juan F. MANZANA POSTOBON s.t. 70 BIDARD, François AG2R LA MONDIALE s.t. 71 VUILLERMOZ, Alexis AG2R LA MONDIALE s.t. 72 OWSIAN, Lukasz CCC SPRANDI POLKOWICE s.t. 73 AIT EL ABDIA, Anass UAE ABU DHABI s.t. 74 BONO, Matteo UAE ABU DHABI s.t. 75 JANSE, Jacques W. DIMENSION DATA s.t. 76 GAUDU, David FDJ s.t. 77 CINK, Ondrej BAHRAIN-MERIDA s.t. 78 DOUBEY, Fabien WANTY-GROUPE GOBERT s.t. 79 VILLELLA, Davide CANNONDALE DRAPAC s.t. 80 DEBESAY, Mekseb DIMENSION DATA s.t. 81 FORMOLO, Davide CANNONDALE DRAPAC s.t. 82 VERMEULEN, Alexey LOTTO NL-JUMBO s.t. 83 MACHADO, Tiago KATUSHA-ALPECIN s.t. 84 DEGAND, Thomas WANTY-GROUPE GOBERT s.t. 85 HOWES, Alex CANNONDALE DRAPAC s.t. 86 STETINA, Peter TREK-SEGAFREDO s.t. 87 PRADES, Eduard CAJA RURAL-SEGUROS RGA s.t. 88 TEN DAM, Laurens TEAM SUNWEB s.t. 89 VICHOT, Arthur FDJ s.t. 90 BEWLEY, Sam ORICA-SCOTT s.t. 91 MARTIN, Guillaume WANTY-GROUPE GOBERT s.t. 92 ROSSETTO, Stephane COFIDIS s.t. 93 MINNAARD, Marco WANTY-GROUPE GOBERT s.t. 94 NIEVE, Mikel SKY s.t. 95 WOODS, Michael CANNONDALE DRAPAC s.t. 96 PLUCINSKI, Leszek CCC SPRANDI POLKOWICE s.t. 97 DENIS, Rohan BMC s.t. 98 ÐURASEK, Kristijan UAE ABU DHABI s.t. 99 MAS, Enric QUICK-STEP FLOORS s.t. 100 HIRT, Jan CCC SPRANDI POLKOWICE s.t. 101 DEIGNAN, Philip SKY s.t. 102 MEINTJES, Louis UAE ABU DHABI s.t. 103 VAUGRENARD, Benoit FDJ s.t. 104 ZUBELDIA, Haimar TREK-SEGAFREDO s.t. 105 LANDA, Mikel SKY s.t. 106 ERVITI, Imanol MOVISTAR s.t. 107 VERVAEKE, Louis LOTTO SOUDAL s.t. 108 TEKLEHAIMANOT, Daniel DIMENSION DATA s.t. 109 CHERNETSKI, Sergei ASTANA s.t. 110 TAARAMÄE, Rein KATUSHA-ALPECIN s.t. 111 GAUTIER, Cyril AG2R LA MONDIALE s.t. 112 VINCENT, Leo FDJ s.t. 113 PANTANO, Jarlinson TREK-SEGAFREDO s.t. 114 REYES, Aldemar MANZANA POSTOBON s.t. 115 PIEDRA, Antonio MANZANA POSTOBON s.t. 116 NIEMIEC, Przemyslaw UAE ABU DHABI s.t. 117 HAMILTON, Christopher TEAM SUNWEB s.t. 118 KIRYIENKA, Vasil SKY s.t. 119 AGUIRRE, Hernan R. MANZANA POSTOBON s.t. 120 FROOME, Christopher SKY s.t. 121 BUDDING, Martijn ROOMPOT-NEDERLANDSE LOTERIJ s.t. 122 SCHULTZ, Nicholas CAJA RURAL-SEGUROS RGA s.t. 123 SOLER, Marc MOVISTAR s.t. 124 GONÇALVES, Jose KATUSHA-ALPECIN s.t. 125 HANSEN, Jesper ASTANA s.t. 126 LUDVIGSSON, Tobias FDJ s.t. 127 PARDILLA, Sergio CAJA RURAL-SEGUROS RGA s.t. 128 GASTAUER, Ben AG2R LA MONDIALE s.t. 129 KOCHETKOV, Pavel KATUSHA-ALPECIN s.t. 130 FRANKINY, Kilian BMC s.t. 131 RUBIO, Diego CAJA RURAL-SEGUROS RGA s.t. 132 MENDES, Jose BORA-HANSGROHE s.t. 133 VERONA, Carlos ORICA-SCOTT s.t. 134 O'CONNOR, Ben DIMENSION DATA s.t. 135 BILBAO, Pello ASTANA s.t. 136 PLAZA, Ruben ORICA-SCOTT s.t. 137 GRMAY, Tsgabu G. BAHRAIN-MERIDA s.t. 138 DOMONT, Axel AG2R LA MONDIALE s.t. 139 BONNAFOND, Guillaume COFIDIS s.t. 140 IRIZAR, Markel TREK-SEGAFREDO s.t. 141 DE MARCHI, Alessandro BMC s.t. 142 TALANSKY, Andrew CANNONDALE DRAPAC s.t. 143 CASTROVIEJO, Jonathan MOVISTAR s.t. 144 KIERLOVSKI, Robert KATUSHA-ALPECIN s.t. 145 SANCHEZ, Samuel BMC s.t. 146 NAVARRO, Daniel COFIDIS s.t. 147 CARTHY, Hugh CANNONDALE DRAPAC s.t. 148 LE BON, Johan FDJ s.t. 149 DE BIE, Sean LOTTO SOUDAL s.t. 150 NOVAK, Domen BAHRAIN-MERIDA s.t. 151 MOLINA, Antonio CAJA RURAL-SEGUROS RGA s.t. 152 MAS, Luis G. CAJA RURAL-SEGUROS RGA s.t. 153 VICIOSO, Angel KATUSHA-ALPECIN s.t. 154 VANENDERT, Jelle LOTTO SOUDAL s.t. 155 MORTON, Lachlan DIMENSION DATA s.t. 156 BRAMBILLA, Gianluca QUICK-STEP FLOORS s.t. 34 GODOY , Caio SOUL BRASIL s.t.